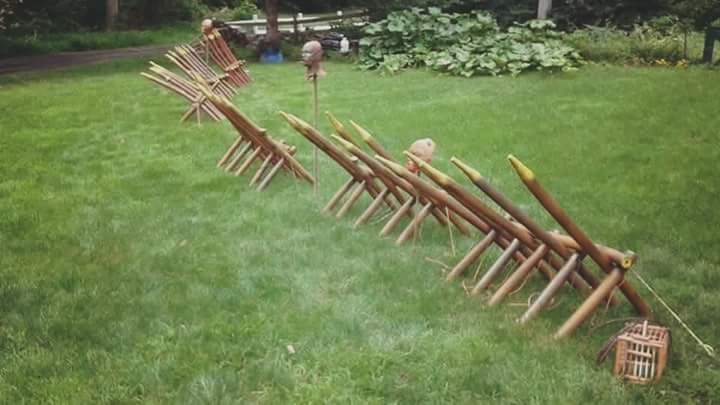 Mar Omega is the creator of this brilliant technique for creating spiked wooden barricades* for LARP games. They're painted pool noodles. The one detail that isn't pretty self-explanatory from the image is how to get the paint to stick. Pool noodles are made from polyethylene foam and almost nothing will bond with the plastic permanently. At a guess I'd say they're coated in spray on Plasti Dip or truck bed liner. *Technically they're Cheval de frise, but that doesn't roll of the tongue nearly as well as "spiked barricade". It’s really amazing how prop makers are producing faux finishes on soft items. The only drawback to using swim noodles is the fact that you have to secure them to the ground so a wind doesn’t carry them away. The Roman legions as a rule about set up a fortified camp for overnight security. For quick construction, legionnaires carried sharpened piece of wood called a sudis. 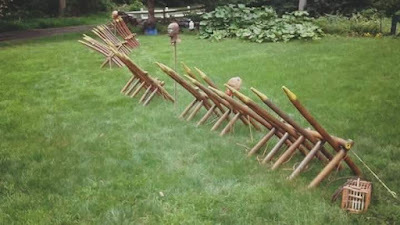 They could be assembled into horizontal walls or a spiked barricade. Others carried additional implements for fortifications. The Romans were pros with fortified portable camps. On the few times they failed to “fort up” near their enemies, they were slaughtered when attacked at night. Spray the noodles with sprayon contact cement - we have kwik grip spray on in Oz. A light dusting will allow the paint to bond to the glue instead of the noodle surface.